Did a cold chill just run up your spine too? The implications are many. While couched as a way to make the U.S. a safer place it’s not a stretch to suggest that the uses for such technology can and will go far beyond keeping Americans safer. In particular, she said, there should be limits on whose faces are loaded into them when they are ready for deployment. Ms. McCall said it would be acceptable to use it for terrorism watch lists, but she feared any effort to systematically track everyone’s public movements by using a comprehensive database of driver’s license photographs. Drifting into other applications in particular piqued my interest. From a marketing perspective, the opportunity to observe and catalog the actual recorded behavior of people, the possibilities are both intriguing and endless. Those possibilities would also be creepy and yet somehow relevant. Being able to process and action the incredible amounts of data is still a monumental task – at present -but it would be short-sighted to think that it will never be possible to access individual behavior data in real time. How might the information be used? Well just an example, and I am taking it to the Nth degree, … Let’s say FRS (facial recognition software) identifies that you walk past a certain coffee shop every day but never actually step into the store. A subscriber to the service could choose to send you an offer to come in and try their coffee (instead of the place you usually go which of course they would have knowledge of as well). The offer is highly relevant since the behavior has already been established. This is unlike a geo-fenced application where if you are inside a defined perimeter you could be served offers for area establishments as that is not based on behavior but geography – not nearly as relevant. The U.S. government will categorically deny that individual behavior data would ever be shared or sold. That’s what they will stick to for now. But drastic times can call for drastic measures and – well you can figure the rest out for yourself. 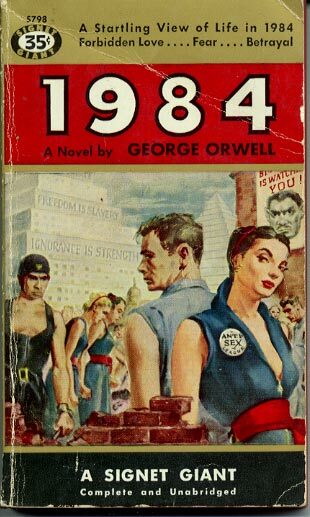 Maybe it’s time to re-read “1984” but I am guessing that will make me feel less comfortable not more comfortable. This entry was posted in Communication, Customer Experiences, Living in the World Today, Marketing stuff and tagged 1984, Electronic Privacy Information Center, Facial recognition software, George Orwell, Ginger McCall, New York Times. Bookmark the permalink.